You’ve determined that your hardwood floors are in good shape but the finishing needs to be redone. You can do it yourself or you can hire a professional. (If you’re dealing with engineered wood, call a professional (me, for instance) as engineered wood consists of several wood layers that are easy to damage. If you’ve chosen to hire a professional, give me a call now at 847-350-7710 for your free, no strings attached, estimate: I offer quality at affordable prices. And, yes, I have happy customers you can talk to about my work for them. So you can have peace of mind. 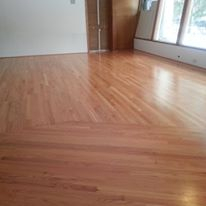 Did you get to this page by Googling hardwood floor installation Chicago rather than refinishing? Call me at 847-350-7710 for a free installation estimate.